Ticketpro is a world leading provider of ticketing services for different events such as music concerts, sports games, theatre performances, etc. The company has many offices in many countries around the world. Ticketpro is one of the sponsors of the International Live Music Conference called ILMC. ILMC is an annual event and every year the organizers choose a special topic. This year’s topic was “The land that time forgot”. We had the task to design a print advertisement for Ticketpro on this topic. We had different funny ideas for the magazine ad design but this is the one that won. 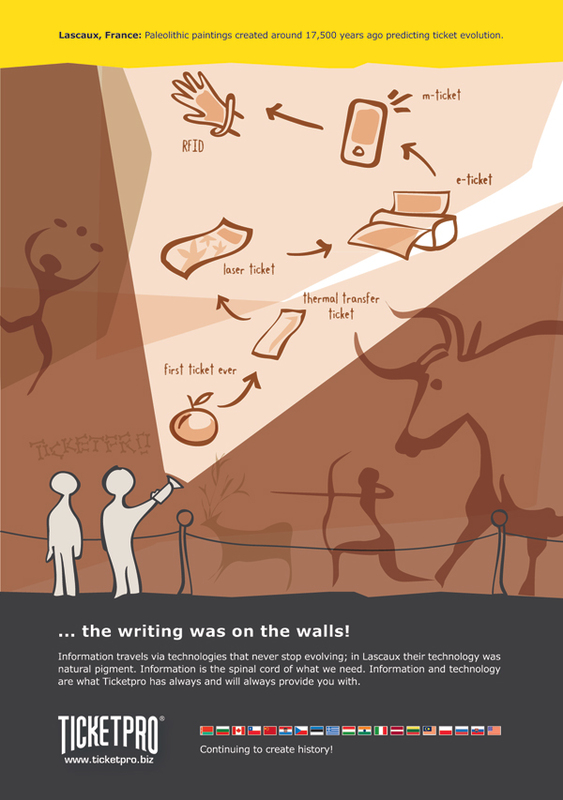 The design shows two guys walking in the Lascaux cave and finding an old cave painting representing the ticket evolution. A careful look will show that the paintings are “signed” by Ticketpro on the side. A funny way to express that Ticketpro is always one step ahead in providing the newest technologies in the ticketing business.